The appeal of Pawleys Island’s laid back vibe is enhanced significantly by several of America’s best golf courses being located within a Dustin Johnson drive of one another. Pawleys was ranked one of America’s best golf islands, and the area’s on-course offerings are anchored by Caledonia and True Blue, both ranked among Golf Magazine’s Top 100 You Can Play, Heritage Club and Pawleys Plantation. Pawleys is home to some of the best Myrtle Beach golf courses. Both Mike Strantz designs, True Blue and Caledonia offer completely different yet equally compelling designs. Caledonia, No. 24 among the Top 100 You Can Play, is a masterful design that is impeccably maintained – think of playing golf in a botanical garden. The soaring live oak trees draped in Spanish moss provided an ideal canvas for Strantz to carve his masterpiece. True Blue is a modern design with expansive fairways framed by waste bunkers and mammoth greens. It’s a terrific course that is certainly worthy of being ranked the 77th best public course in America. Many golfers will argue that Heritage is the area’s best course – it has been ranked as high as No. 33 on Golf Digest’s list of America’s 100 Greatest Public Courses – and it’s a position that is easy to defend. Playing on property that oozes lowcountry South Carolina charm, Heritage is a beautiful design. While those four courses attract the majority of the national attention, they are hardly alone in their quality. 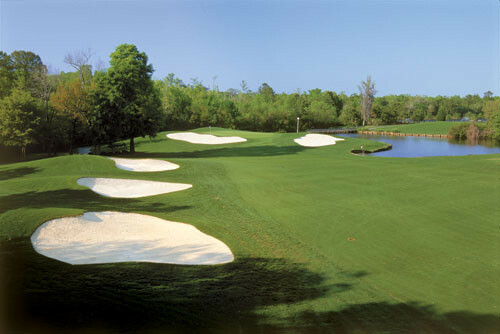 Founders Club, with waste bunkers framing every fairway, is one of the area’s most creative designs. The course quietly but comfortably took its place among some of the nation’s best courses upon its 2008 opening. Willbrook, Litchfield Country Club, River Club and Tradition Club, located in the Litchfield Beach section of Pawleys Island, are big part of what makes the area so special. The quartet flies under the proverbial radar but provide an outstanding golf experience. Litchfield is an old-school design, featuring tree-lined fairways, an abundance of doglegs, and, by modern standards, smallish greens. If you value classic golf course architecture, it’s a must-play. Ironically, River Club doesn’t play along a river, but there is ample water on this beauty. The 14th, an island green par 3, and 18th, a great risk-reward par 5, have been ranked among Myrtle Beach’s top 100 holes and form the backbone of an outstanding track. Tradition Club, as the name suggests, is a tip of the cap to the game’s classic parkland designs. But don’t in anyway confuse tradition with boring or ordinary. Architect Ron Garl crafted a course that pays homage to the game’s roots while also including a little excitement, primarily in the form of a pair of island greens, the par 4 seventh and par 3 15th. Willbrook is one of the area’s most underrated courses. The live oak trees and lowcountry property combined with the work of Dan Maples make Willbrook an outstanding round of golf. If you have the opportunity to play it, do so and thank me later. Celebration with the Indigo Choral Society at Kaminski House Museumin Georgetown at 7pm. Don’t forget to bring your chair! Fireworks at Barefoot Landing at 10:15 pm. Cherry Grove Pier Fireworksat 9:30 pm. “Saluting our Founding Fathers” with a patriotic boat parade at 5pm. Fireworks begin at 10pm! Pawleys Island Annual Parade –10am-11pm – Come celebrate island style! Myrtle Beach Hot Summer Nights Fireworks at 2nd Ave. Pier at dark. Independence Music Blast at La Belle Amie Vineyards – 12pm-5pm – Bring your chair for all day music, BBQ, and wine tastings! Going south on Highway 17 from Litchfield Beach into Pawleys Island, just past Sam’s Corner and before the Fresh Market, on the left side of 17 off of Beach Road, there is a broken down building and a magnificent beach view just beyond. Going south on Highway 17 from Litchfield Beach into Pawleys Island, just past Sam’s Corner and before the Fresh Market, on the left side of 17 off of Beach Road, there is a broken down building and a magnificent beach view just beyond. – See more at: http://life-in-pi.com/blog/436-pawleys-islands-very-own-secret-garden#sthash.Anq5pCan.dpuGoing south on Highway 17 from Litchfield Beach into Pawleys Island, just past Sam’s Corner and before the Fresh Market, on the left side of 17 off of Beach Road, there is a broken down building and a magnificent beach view just beyond. The dilapidated motel is all that remains of one of the most popular black resorts of its time. The beach was named after Frank McKenzie, one of the resort’s founders. He and Pawleys Island native Lillan Pyatt acquired the land in 1934 and began developing shortly thereafter. McKenzie and Pyatt envisioned a place where blacks, without fear of racial discrimination, could visit the beach, enjoy great food, strong drinks and live music. In the mid-1930’s, construction began on the causeway that would run across Midway Creek and connect the mainland to the south end of Litchfield Beach. Over the next few years, they would complete the causeway, while adding a pavilion and 15 cabins. Word spread quickly and by the late 1930’s, popular musicians such as Count Basie, Duke Ellington and Charlie ‘Bird’ Parker were playing there on a regular basis. The resort continued to grow until 1954, when Hurricane Hazel destroyed the causeway, pavilion and most of the cabins. McKenzie dissolved his relationship with Pyatt and opened a small motel and bait shop on the mainland. While the resort regained popularity, things were never the same. McKenzie sold the property due to financial hardship in the late 1960’s. The new owners closed the access to the beach and let the hotel fall into disrepair. Though uninhabited, there is a majestic beauty that surrounds the ruins and evokes a natural energy of years long passed. These are very precise measured directions. At the stop sign at the top of the exit ramp, turn right. In two-tenths of a mile, you will come to a dead end with a stop sign. Turn left. Go about a half mile and “Screaming Eagle Road” will fork off to the right. Take the right fork. Set your odometer and go about 8 miles on “Screaming Eagle Road” to a dead end. Turn right. This is McCord’s Ferry Road. Set odometer and go 8.5 miles. Go under to overpass and immediately turn left, east on Highway 76. Set odometer. Go about 18 miles. Just past a stop light there is a sign saying “Florence-Conway.” Yield here to oncoming traffic, and take a left. Set your odometer and go 15.3 miles. After 9.8 miles there is a fork in the road. Take the right fork, toward Nesmith, and set your odometer. (Remember what Yogi Berra said. “When you come to a fork in the road, take it.”) Go about 16 miles and there is a stop sign. Go straight across and you are on Highway 51, which leads to Georgetown. Exit from I-95 at Dillon and follow Rt. 301 to Latta, than 501 and Marion Bypass. From Georgetown take Highway 17 north to Litchfield Beach. (HINT: Upon entering Georgetown, you can save a minute or two by turning left – about a 45 degree turn at the Scotchman convenience store. This road goes by Georgetown Hospital and is a shortcut to Highway 17. At the traffic light on 17 you’ll be taking a left and that will be Highway 17, headed north.) It may seem like you have gone a ling way out of your way, but it is just a little over 15 miles difference coming this way instead of going through Conway and Myrtle Beach.